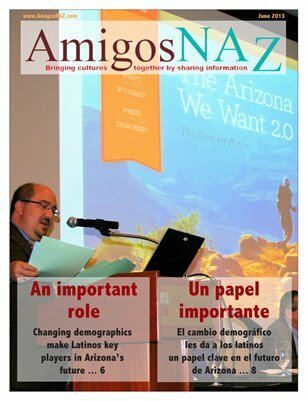 The June 2013 bilingual edition of AmigosNAZ opens with a cover story on the growing role Latinos will play in Arizona’s future. The edition also includes an invitation for the public to attend the monthly meeting of the Coconino Hispanic Advisory Council, local stories on an award presentation to an elementary school principal and fundraising efforts for an immigrant humanitarian group, information on upcoming cultural events in Northern Arizona, a preview of slideshows of various events in the region, bilingual information on different types of glaucoma, options for preserving your digital photos, a travel column on discovering Tubac, tips on how to determin if a wedding loan is right for you and reasons why Latin cooking can improve your health. All this and more brought to you by AmigosNAZ — Providing information for and about the vibrant Latino community in Northern Arizona.